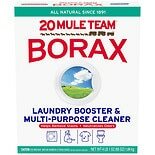 20 Mule Team Borax Natural La...76 oz. All Natural | Adds Extra Cleaning & Freshening Power | Value Price! Arm & Hammer® Super Washing Soda gets your whole wash cleaner, whiter and fresher, without the damage bleaches can cause. And it costs a whole lot less. That makes Arm & Hammer® Super Washing Soda a great value. Super Washing Soda also makes a great all-around household cleaner. It increases your detergent's cleaning power to get out ground-in dirt and stains and cut through greasy soils. It helps neutralize and eliminate odors, not cover them up with perfumes. 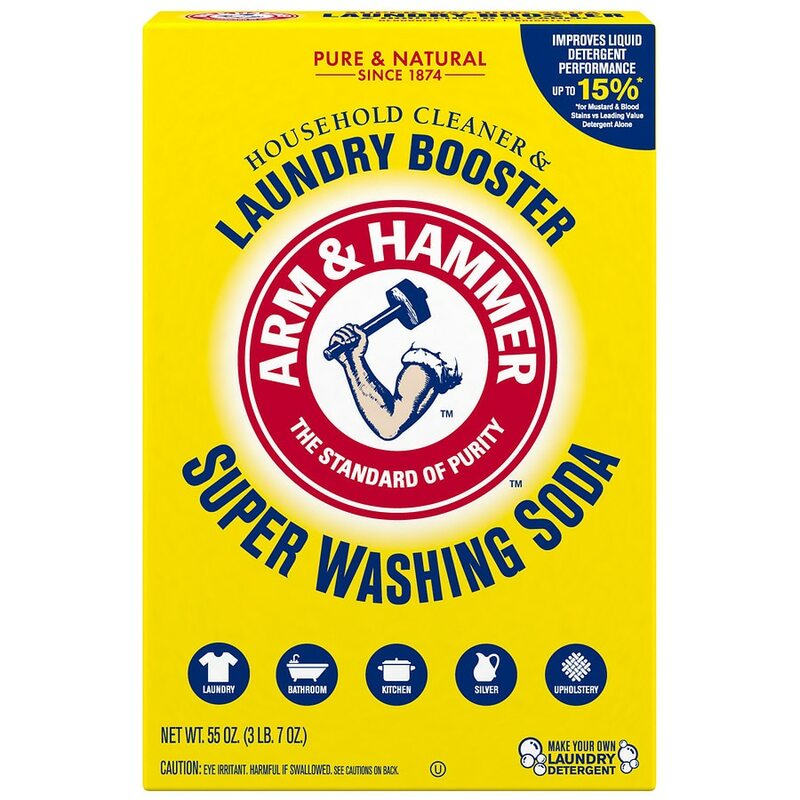 Arm & Hammer® Super Washing Soda - The Cleaning Booster - can help your detergent remove strains that detergents alone simply can't handle. To remove extra tough stains, pre-treat or pre-soak with Arm & Hammer® Super Washing Soda. An Excellent Household Cleaner, Too: Arm & Hammer® Super Washing Soda cleans grease, grime and dirt from surfaces all around your home. It's sudsless, too, so it rinses easily. Try Arm & Hammer® Super Washing Soda on your tough cleaning problems and watch grease and dirt disappear. The Arm & Hammer® Guarantee: If not completely satisfied with Arm & Hammer Super Washing Soda, return partially used box for full refund. Add 1/2 cup of Super Washing Soda along with either liquid or powder detergent at beginning of wash cycle. Add clothes and let washer fill completely. Tough Dirt: With especially dirty clothes, extra large loads or hard water conditions, use 1 full cup of Super Washing Soda. Fill container with warm water. Add 2tbsps. of Super Washing Soda per gallon of water of 1/2 cup in washer. Pre-soak for at least 30 minutes before washing. For best results, pre-soak overnight, and then add 1/2 cup of Super Washing Soda along with detergent in wash cycle. Mix about 4 tablespoons of Super Washing Soda in 1/4 cup (2oz) of warm water to make a paste. Dampen problem area. Using rubber gloves, gently rub stain with paste. Then wash as usual. Dissolve 1/2 cup of Super Washing Soda per bucket of warm water. Wash surface, wearing rubber gloves; then rinse. Not recommended for aluminum surfaces; may cause discoloration. Not recommended for no-wax floors. Traps and Drains: Do not use for blocked drains. To help keep traps and drains open, dissolve 1/2 cup per gallon of warm water. Run hot water down drain, add Super Washing Soda solution, then flush with hot water. ©1992 Church & Dwight Co., Inc. Harmful if swallowed. May irritate eyes. Contains Sodium Carbonate. Avoid contact with eyes. If contact is made, flush with water. If swallowed, give water or milk. Contact a physician.